Radiation Absorption and Manipulation: Exposure to high levels of radiation has mutated the Radioactive Man’s body. 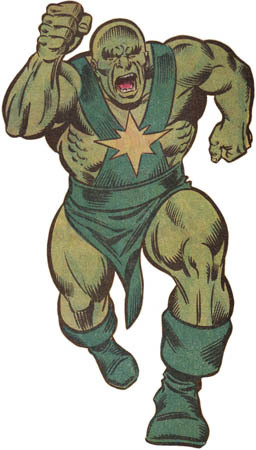 As a result, He has the ability to absorb and manipulate high levels of radiation for a number of purposes and effects: energy blasts, emit hard radiation, create force fields and boost his own strength to super human levels. Dr. Chen Lu was a respected nuclear physicist for the People's Republic of China. After the thunder god Thor thwarted a Chinese military incursion into India, the Chinese government called upon its scientists and military strategists for a way to retaliate against Thor. Chen Lu had already been experimenting for several years with a way of harnessing nuclear radioactivity to induce superhuman powers in human beings. Chen Lu, concealing his own aspirations of world conquest, volunteered to become China's human weapon against Thor. Having already spent months immunizing himself against the harmful effects of radiation, Chen Lu exposed himself to massive doses of specific-particle radiation, thereby mutating his body. After impressing his superiors with a demonstration of the new superhuman powers he had gained, Chen Lu, calling himself the Radioactive Man, traveled to New York City to challenge Thor.